Must be returned back to Allergy Purifiers LLC within 15 days of delivery. A return authorization number is required for all returns. A restocking fee may apply. These terms apply to all refunds. All products are shipped with a repair/replacement warranty period. Please inform us ASAP at info@o3ozone.com of any order discrepancy, product malfunction, or your intent to return so that we may investigate and resolve the situation accordingly. If damage were to occur in shipping, please call so we can remedy the problem quickly. Your experience returning your purchase will be smooth and easy. Please email at info@o3ozone.com for instructions and RMA number. The reason for return must be included in your email to us. Feel free to call us at 330-497-6900 for questions you may have about returning an item. We have very few returns and will ask why you are returning the item simply so we can attempt to solve the problem for our present and future customers. Refunds are limited to the purchase price of the items, any and all shipping or other charges are the responsibility of the customer. All items being returned must be in like new condition. If the item being returned has been damaged, abused, or used excessively there will be a charge for that damage, use, or abuse. If the damage is not repairable the return policy is void. Any item being returned must be in the original packaging otherwise a packaging fee and/or higher shipping charges may apply. If you purchased an item with free shipping (shipping included or discounted shipping), the actual cost of the shipping will be deducted from the refund. Ozone generators that show signs of use are sold at a discounted price. A fee of 20% of the amount paid may be deducted at our discretion. 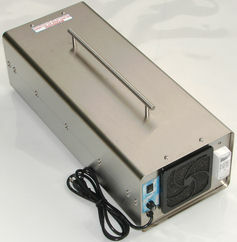 Returns are limited to one ozone generator. Purchasing 2 or more ozone generators will automatically exclude one from the return policy. Exchange Note: If an ozone generator is sold for shock treatment purposes, it is not possible to over-ozonate using a higher output machine. The higher the output, the quicker the treatment time. For this reason, we suggest emailing us before the sale to let us help determine the proper sized unit for your application. Exchanges for shock treatment applications should be for a larger unit. If you desire occupied air purification, it is recommended to purchase a separate unit sized for this purpose. Please understand that the policy is designed to avoid those who buy with the intension to return, like a rental, as permanent results are often achieved with an effective shock treatment for mold, smoke damage, or odors. **NOTE: Some commercial items may only be returned for replacement or exchanged for a larger unit within 15 days only. Overnight Shipping is not guaranteed as we cannot be responsible for potential delays created or inherent with overnight shipping services, such as DHL Express or Fed-Ex. We can only guarantee what the shipping company will guarantee - and this varies from area to area. If you require overnight shipping or a guaranteed shipping date, this will be at an additional cost based on the service, and you must inform us at the time of sale that you require a guaranteed shipping date. Reasons for delays not covered in any shipping date guarantee can include weather, catastrophic events, or customs delays for orders crossing borders. We can only guarantee shipping dates based on what the carrier will guarantee. UV PRO 550 *popular, Professional Choice.This is the new choice for Commercial Ozone Applications / users!